A year ago today I got my wheelchair! I was almost completely bedridden at the time. Walking just a few steps every hour or two just to keep circulation and muscles alive was a chore. As a family we were house-sitting in the Lake District at the time. It was a long term arrangement, so was kind of our home away from home, but I had been confined to an upstairs bedroom and was unable to get out to see the countryside around me. I would enjoy, for a few minutes, watching the birds at the feeders outside my window and the gorgeous orchids that adorned every windowsill. Although it was a freezing cold winter, I longed to go out and explore. It was at an airport in London in 2015. I was on my way to visit my family in Italy for the summer as usual, all on my own and this time severely ill and unable to walk very far without immense pain and weakness which would last for days, so I took advantage of the free wheelchair assistance. After making my way to the airport by coach, I arrived at the entrance and used the intercom system to call the assistance. My assistant was an elderly man who had to push me through the entire airport - it was a long way so I felt equally bad for him and happy for myself! As he started pushing me I was suddenly overcome with the realisation of what was happening. I was the one who usually pushed the wheelchair - I had worked with disabled children until just a few months earlier when I suddenly became disabled myself. It was a rush of feelings that poured out of my eyes for a few minutes and then I was just grateful. I knew what it was like to be on the other side, now I was experiencing what my kids would have experienced. The sensory overload, the cognitive dysfunction, the inability to help myself, being dependent on another human being. I started learning and understanding a side of my previous life that I never had access to before. I have since used this service a few times and it has always been amazing and helped me so much! I have heard many people comment about how they would hate seeing the wheelchair in the house because it's a reminder of one's disability or they speak of being confined to a wheelchair. I don't need the wheelchair to remind me of my disability, it is a constant companion that I cannot ignore because if I happen to forget and get up too fast or pick something up or try to help tidy something or prepare a drink for myself, my body lets me know loud and clear that I'm not capable of doing "healthy person activities". The wheelchair doesn't add to that at all. I never saw my wheelchair as a negative thing. In my eyes a wheelchair isn't confinement, it's freedom. It allows me to move more and go out more than I could without it. It's a liberator, not a restrictor. I never saw my wheelchair as a negative thing. In my eyes a wheelchair isn't confinement, it's freedom! I got my first wheels!! Messy hair, don't care. Tired and sore, but super happy! Perhaps I won't have to wait months between outings if I can save energy on walking. Still walk hourly in the room and will only use the wheels when I go out, to lessen the impact of outings and be able to enjoy them more. Praise God! Love it! 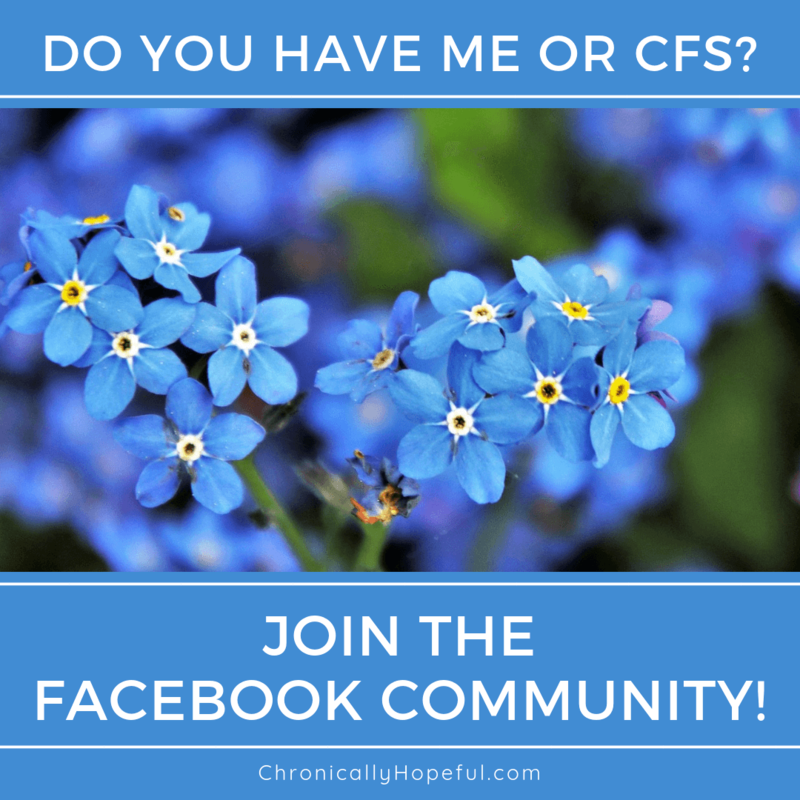 Having ME/CFS means that self-propelling would require much exertion and energy that I do not have. It causes me a lot of pain and fatigue. The problem is that I am not very good at sitting still and waiting if somebody parks me in an isle while we are out shopping. When I'm out on those rare occasions, I want to explore and see everything - I will self-propel if I have the option. So we bought a chair without that option - for my own good. During that time at the house-sitting I was quite weak. At my worst really. Almost completely bedridden. I would colour a little and crochet a little and that's about it. Some days I'd eat one meal with my family, on the sofa, the rest of the time I'd be in my bed because being around other people was too much for me. They'd come into my room, one at a time, in the mornings to give me a hug and somebody would carry a tray of food up to me each mealtime. They were all so close, yet I was isolated much of the time. Getting a wheelchair was our way of hopefully getting me out of the house sometimes. We did go out once during the months we stayed there, it was a lovely few hours at the lakes. My first outing in my new chair. They carried me downstairs in it so I wouldn't have to exert more than the absolute necessary. One year on and I'm managing hundreds of steps a day, still housebound, though I have often managed over 1000 steps in a day thanks to the ketogenic diet I'm on now, but for one reason or another, as is common in ME/CFS, I often struggle to make 800 steps a day regularly. Today I started something new though. I walked out to the front door of our building! It's only about 16 steps from my bed, no stairs, so practically like walking to our kitchen, but the excitement involved in going out there and seeing the outside has an incredible effect on me! So I have decided I need to normalise the mailbox walk. I need to do it regularly so my body doesn't freak out like a puppy going out for walkies! the first is to go check for mail daily - normalise the mail walk and then the other is leaving the house, with my wheels, once a month. I'd like to not wait 5 months before going out again. I hope my body will play along. After about three months, if all is well, I will try once a fortnight and see how that goes. I'm very excited for warmer weather and getting out in the countryside or even the seaside. Here's to a marvellous 2018 - full of little adventures outdoors! How do you feel about your wheelchair? How did you feel when you got your first wheelchair? Has that feeling changed over time? ​Have you tried other mobility equipment? That bike sounds like fun! It really does make a huge difference if it can give us a little more independence. Thanks for sharing such an intimate post. As a wheelchair provider, I learned a lot and gained some insight as a result. Sometime in my line of work, we always try to get the patient the best equipment we can. the big fancy wheelchair with all the bells and whistles. Sometimes, though, we forget that the patient may just want something more simple. I’m glad the article was helpful. I know what you mean. I worked with disabled children before I became disabled myself, so I understand wanting to offer the best equipment with the most options, but my personal experience has been opposite. I sometimes wonder about a mobility scooter or motorised wheelchair, but I’m not sure my body can handle that either. I’d have to test one for a while before investing in such an upgrade! I have on occasion also needed to use a wheel chair and what supprised me was the feeling and fear of being out od control when someone pushed me. Something to adjust to ? Yes, that does take some getting used to. Slowing down helps. Now that I’m in a wheelchair myself I feel guilty for the way I used to push the children I worked with. They really should let us sit in a chair and experience it before allowing us to work with people in wheelchairs! This is a great post. I don’t have a wheelchair myself but I love your attitude towards it and how it has made a difference to your life! Thanks, Jenna! Unfortunately I still can’t use it very often, a few times a year, but that’s a few more outings than I would have managed without it, so very happy!